CNN did a report this morning from Phoenix about their thousands of vacant homes. 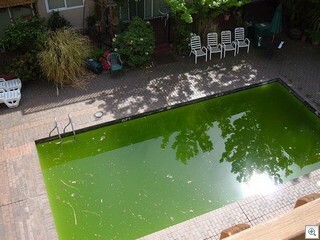 Their biggest problem is swimming pools that aren’t being maintained that have become breeding ponds for Mosquitos. The Las Vegas Association of Realtors issued a request for all agents to report green pools at vacant houses to the Clark County Health District. We’re asking our readers to help also. If you know of an abandoned or bank owned vacant property near you, and you know it has a pool, then take a peek over the wall and report it the health district at 759–1220 or online at Southern Nevada Health District. Normally Mosquitos aren’t a problem in Las Vegas (one of the many reasons I love living in LV) but there have been reports of West Nile Virus in a few clusters of mosquitos that have been identified.